Welcome to another episode of the Art of Business English, this is episode 69 and the third and final part of my mini-series on preposition and noun combinations. 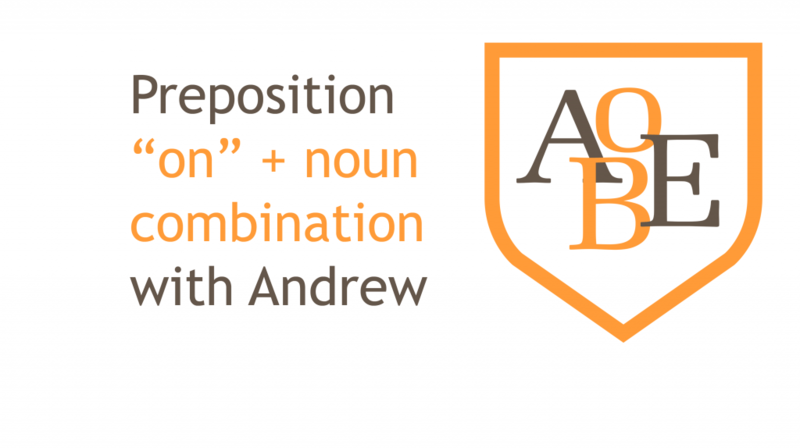 In episode 67 I looked at the preposition “at” with nouns, as well as explain how these combinations work. In episode 68 I look at the preposition “by” and in today’s episode I am going to finish the series by look at the preposition “on”. If you haven’t had the chance to listen to the previous two episodes, then I encourage you to go back and listen to them. I offer a very useful list of vocabulary and expressions. Let’s take a look at what we are going to cover today. I will follow the same format as in previous episodes. Before I start, I hope you’re enjoying this series and if you have any suggestions or there are some areas that you would like to understand better then just send me an email and I will be more than happy to put something together for you. As with the last two episodes, I am going to give you the list as well as the translation for each of the preposition and noun combinations. In today’s list I have provided you with 23 combinations. Now I will give you some example sentences to really put these expressions into context. on time Employees should always arrive on time to meetings. on trial The company director went on trial for wire fraud. on TV/the radio Did you see me on TV last night? on the Internet I found this interesting article on the internet. on the whole On the whole, I would say this event was a success. on sale We are about to put our new hair dryer on sale. on loan Football players can find themselves on loan to other clubs. on fire Ryan is really on fire at the moment. Everything he touches turns to gold. on the phone John is on the phone at the moment. Can I take a message? on foot Sometimes going on foot can be faster than taking the car. Especially when you get stuck in traffic. on the other hand On the one hand, I like concept “A”, on the other hand I think concept “B” is more practical. on holiday John is on holiday for the next two weeks. I’m afraid you will have to call back then. on the increase Credit card fraud is on the increase. Bad news for banks and consumers. on behalf of I would like to thank you for your many years of service on behalf of the whole company. on account of The spring garden party was postponed on account of the poor weather. on a diet Many people decide to go on a diet after Christmas. This is in fact pointless. A year-round healthy lifestyle is the secret to controlling your weight. on order I have a new car on order from my local car dealer. on a journey Mike and Janice are on a journey of a life time. They are traveling around the world together. on sb’s mind I’ve had this problem on my mind for the past few days. on purpose I am sure Jill didn’t make this mistake on purpose. We should give her the benefit of the doubt. on duty We have a security team on duty 24 hours a day. on business I will be away on business for the next two days. on second thoughts On second thoughts, maybe it would be a good idea to bring an umbrella. So, there you have it, the final part of my three-part mini-series into preposition and noun combinations. If you want to study this material further, then head over to the AOBE website. You can sign up for the transcript or take a look at the video of the episode. I hope you have found this mini-series useful and I hope that I have clarified the correct use of some of these expressions. There are some really common mistakes made by non-native speakers particularly when trying to use the correct preposition. Remember, these are fixed structures, so you just need to learn and memorise them. If you are listening to this episode in March of 2019 then this is just a quick heads up to let you know that we are redesigning the Art of Business English website and it should be ready by the end of the month. To co-inside with the launch of the new website we will also be launching some new courses and members benefits. I will look forward to your feedback. Well that is all from me, I hope you have a great week. Bye for now.